A line of herbal cough medicine sold in six states has been recalled after it was found to contain morphine. Licorice Coughing Liquid from California-based Master Herbs, Inc. has been voluntarily pulled from shelves after the discovery. According to the Food and Drug Administration , consumer bottles of Licorice Coughing Liquid were found to include morphine, which was not a listed ingredient. "Consumers using this product may not be aware they are ingesting morphine," a release from the FDA stated on Thursday. "The unware (sic) ingestion of morphine can lead to life-threatening respiratory depression and death." 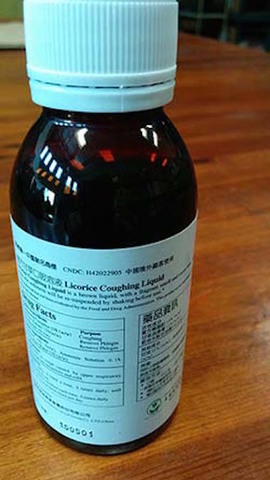 Master Herbs' Licorice Coughing Liquid is sold at Chinese grocery stores across California, Hawaii, Illinois, Nevada, New Jersey and Ohio. People that bought the product are advised to return it to the store from which it was purchased. Consumers can also reach the company by phone at 626-319-9915.